Review date: 13 April 2002. Oh, it gets the job done, all right. When you need something that'll fill the air gaps between a hot thing and a heat sink, then plain cheap white thermal goop, or fancy silver-loaded overclockers' special compound, will do it. And both compounds will do it about as well as each other, if my previous research on the subject is anything to go by. Cheap grease will dry out over time; expensive grease will stay squishy. Some kinds of grease will "migrate" out of the place where they're meant to be, and others won't. None of this matters much for PC cooling purposes, since most PC CPUs aren't used for long enough, or in a harsh enough environment, for the thermal goop to degrade unacceptably. So as long as you're not planning on ferocious overclocking or trying to make a high powered machine that'll run peacefully in a cupboard for ten years, any thermal goop should work fine for PC chip-cooling purposes. The problem with thermal grease isn't the effectiveness of the stuff at conducting heat. The problem is the annoyingness of getting the right amount of goop where you want it to be, without turning yourself into the Creature From The Heat Sink Grease Lagoon. Or creating something that'll end up on some bitter support guy's Web site. The amount of thermal compound you want to use on practically any PC chip-to-heat-sink junction is: Not much. You just want to fill the air gaps. Even if you've got a large-contact-patch chip and a heat sink with a quite uneven base, the total air space between the two is likely to only be a few cubic millimetres. With mirror-finish small-contact-patch CPUs and very flat fancy heat sinks, the gap volume is much smaller. And you only need enough grease to fill that volume. More grease is, at best, wasted. At worst, it gets in the way of direct chip-to-sink contact and impedes heat transfer. But it's impossible to put a teeny-tiny amount of thermal compound on the top of a chip, or the bottom of a heat sink. About the best you can do is put a splodge of the stuff on one side of the contact area, then wipe it across with a credit card or something. That'll leave a suitably thin layer behind, if you do it right. Now you've got goop on your library card, of course, but at least you feel a bit more scientific than the people who just smear grease on with their finger. For the average PC tweaker, the credit-card-spreader technique is adequate. If you're doing the job over and over, though, there's no way to do it with ordinary thermal grease that isn't messy and wasteful. Many CPU cooler manufacturers solve the problem for you, at least the first time, by pre-installing some kind of thermal compound on the bottom of their coolers. In the olden days a couple of years ago, rubbery thermal pads were common; they perform quite poorly, but you can usually remove and replace the cooler without having to replace the thermal pad as well, and they work well enough for low-heat CPUs. Most pre-applied thermal stuff these days is either a neat square of grease applied by a machine (generally using the same basic techniques used to silk-screen T-shirts), or a pad of stuff with the consistency of flaky chewing gum. Neither of these compounds can be used more than once - if you remove the cooler, you have to wipe and/or scrape it clean and apply new goop. But these sorts of pre-applied compound generally work well, and the gummy variety won't come off all over everything that touches it, which is nice. The reason why the gummy stuff works is that it's "phase change" material that's made to melt, or at least soften, when the chip it's touching gets warm. The soft goop can then flow into all of the little nooks and crannies, and excess can be squished out around the contact patch. If you're not a big business that can afford compound applying machines, but you'd still like the convenience of a thermal compound application method that involves no peanut-butter-sandwich flashbacks, it turns out that there is, in fact, a solution. There are a few of them, in fact. Here, courtesy of Power Devices (a division of glue giant Loctite), are some products that allow one to rid oneself of the curse that is thermal grease. The big rolls contain Powerstrate 51 squares, in two of the several available sizes. 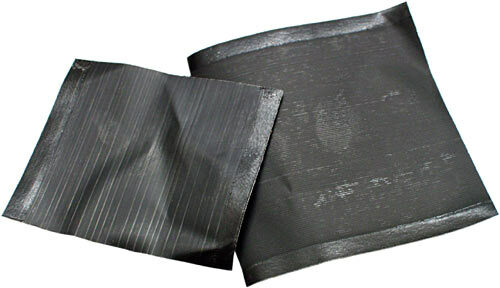 They're patented self-adhesive pads, with an aluminium foil core coated on either side with phase-change goop. If you're making CPU coolers, these things are just what you want. If you're J. Random Overclocker, the fact that they normally come on a reel containing at least a thousand units will probably turn you off. Not to worry; there are also these things. They're "bar applicators" for two varieties of solid waxy thermal compound, which you just rub onto heat sinks or components. No blobs, no drips, no wiping, no finding dabs of grease on your fingers only after you've scratched your nose, straightened your hairdo and idly brushed your hand over your good suede jacket. 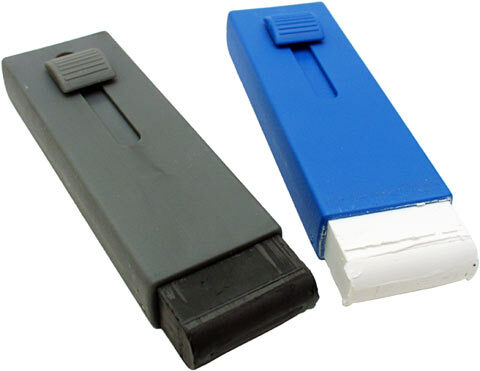 Just a plastic-cased applicator like a fat crayon. Take the cap off, slide the little knob on the side if you've used enough compound that none sticks out any more. It's like high-tech lipstick. 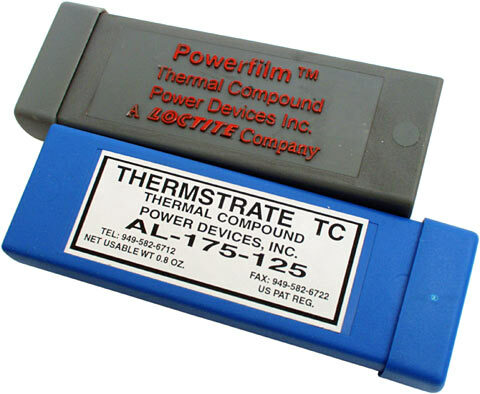 Thermstrate TC is the white stuff (which has the wrong part number printed on its label, for some reason; it should be ""TC-175-125"). Powerfilm is the black stuff. 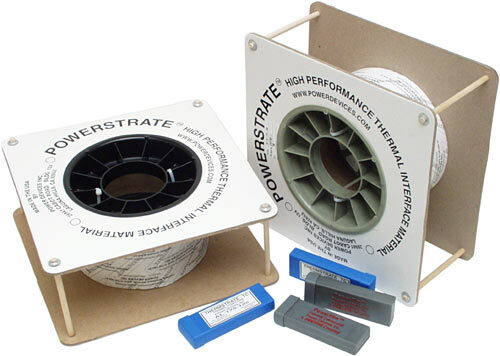 The only real difference between them from an end user's point of view is that the phase change temperature for Thermstrate is 60°C, while Powerfilm is 51°C - the same as the stuff on the Powerstrate 51 squares. The phase change temperature is the only disadvantage of this sort of thermal compound, compared with grease. Until it's been heated at least once to the phase change temperature, this kind of compound won't work properly. It has to get warm in order to soften and flow into the thin continuous layer that gives good thermal contact. If you've got a red-hot overclocked CPU, you'll probably not have much trouble getting the junction point past the phase change temperature for either of these compounds, even if your Loud 'N' Chunky CPU cooler's screaming away full blast. The way to make it happen with lower powered CPUs is simply to unplug the CPU fan, which'll result in all but the coolest CPUs getting the junction well past the phase change temperature in not very many minutes. Both of these goops have a positive coefficent of thermal expansion - which is to say, they expand when they're hot. That's good; it means the soft warm goop will actively expand into nooks and crannies in the contact area, and push out air pockets. To evaluate the effectiveness of the Power Devices products, I set up the same test rig I'd used in my previous compound comparison. One 50 watt CPU-simulating heater, one Thermaltake Volcano 6Cu+ CPU cooler, no spacer in between to reduce the contact patch and introduce extra variables. The Volcano 6Cu+ has a round, raised copper slug in the middle of its base, which made it easy for me to get a pretty well standardised contact area for testing the applicator-bar compound. I'd just colour in the whole base with the compound, I thought, just like I did when I tested the different greases. No problem. Unfortunately, I discovered that actually doing this with the 6Cu+ was an experience not unlike trying to colour in a pane of glass with a crayon. The waxy compound sticks to itself better than it sticks to the bottom of the 6Cu+. So I ended up caking it up and pushing it around and generally annoying myself. Warming the heat sink up didn't seem to help. It turned out that I had adroitly chosen what seems to be the single most annoying heat sink in the world to apply this stuff to. 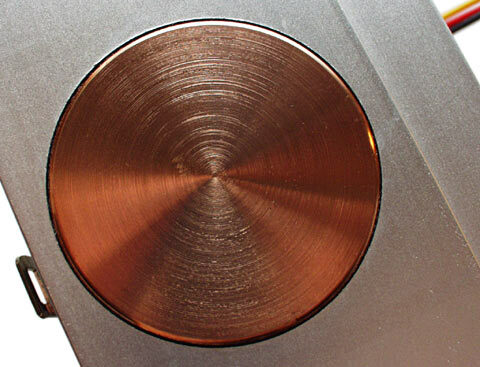 The copper disc in the bottom of the 6Cu/6Cu+ heat sink (the two Volcanoes have different fans, but are otherwise identical) has concentric ridges which could've been specially designed to make it crayon-resistant. When I tried applying the Power Devices compound to the mirror-finish copper base of a Thermalright AX-7, and to a yum cha reasonably flat aluminium heat sink, both compounds went on just fine. You won't get a perfectly even layer with just one pass over the heat sink with the end of the compound crayon, but it's really not far from it. Just as Power Devices claim, you can just drag the applicator over the contact area once, and get enough compound applied for it to melt into a pretty optimal layer. The 6Cu+ was the cooler I'd used for the previous tests, though, so I scribbled and scraped and fiddled until I'd managed to create a layer of Thermstrate TC on it that was pretty much as good as the one created by a simple wipe over the base of a more cooperative heat sink. And onto the heater it went. First, by way of an experiment, I tried just jumping straight into a test, without giving the rig a no-fan pre-heating run to let the compound bed in. True to Power Devices' word, this resulted in un-thrilling performance. An overall thermal resistance figure of 0.62°C/W, versus 0.48°C/W for the normal thermal grease I'd re-tested beforehand, to make sure there was nothing wrong with the test rig. 0.62°C/W isn't much better than the result this rig delivers with no thermal compound at all. But that's to be expected, when you're using waxy compoound that's still all lumpy and un-melted. Now, I powered down the fan but not the heater, and let the heater temperature rise well past the phase change point. When the heater probe reached 100°C, I figured the junction point had to be not a great deal cooler; that'd do. These compounds are rated for operation up to 150°C, so I was in no danger of cooking anything. With the fan back on, the performance score settled down to a very pleasing 0.46°C/W. Not an astounding result, but not a lousy one either, and better than the grease. Power Devices say that their compounds' performance can be expected to increase somewhat over multiple thermal cycles, versus the slow decrease in performance that greases tend to show thanks to drying out, migration or both. I tried a couple more bake-and-test cycles with the Thermstrate TC, but it made no measurable difference. I guess I'd baking it with sufficient enthusiasm the first time that it didn't have much more flowing to do. When I repeated this procedure with the Powerfilm applicator, the after-melt-in score was the same. 0.46°C/W again. On to the larger Thermstrate SA pads I'd been sent. These pads are made in various sizes; I got ones suitable for current PC socket CPUs, large and small. One of the big ones more or less matched the size of the 6Cu+'s copper disc. The Thermstrate pads are easy to deal with. You just peel them off (possibly by using one of the "rollover ejector dowels" in the corner of the reel), and stick them on. The foil's two thousandths of an inch thick, (0.051mm) which makes it more rigid than ordinary light aluminium kitchen foil (which is about 0.01 to 0.02mm thick), but not by a wide margin. 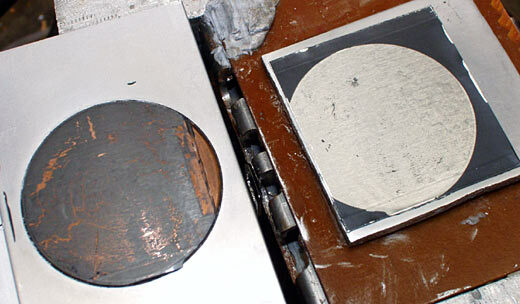 The Thermstrate pads are thus pretty much impossible to handle without bending them, as the rather uneven objects in the above photo demonstrate. That's not a big problem, though; only if you stick the pad onto the heat sink in a particularly crumpled state will it fail to work properly. If the pads had adhesive all over one side, then the glue would damage their thermal performance. Power Devices get around this problem in a simple enough way - the pads are a bit wider than they have to be, and there's a thin strip of glue on each side. This keeps the glue away from the contact patch, and also make it easier to stick them on. You just attach one side, then smooth the pad over until the other side sticks. Less glue means it's harder to wrinkle the pad as you stick it on. And, unlike some other pads, these ones don't need any special surface preparation or pre-heating. Power Devices describe the Thermstrate SA installation procedure in more detail on their pages for the pads, starting here. The 6Cu+'s heat sink disc overlapped the adhesive-strip edges of the large pad a bit, but not enough to have a huge impact on the result. Which was, wait for it, 0.46°C/W again. Which is rather impressive, for a thermal pad. I'm used to anything with a solid core being a pretty lousy conductor. After use, it was clear that the Powerstrate compound had no trouble sticking to the copper disc. In case you're wondering why these test numbers are so suspiciously similar, bear in mind that the granularity of my test rig - the smallest difference it can register - is little better than 0.02°C/W, around this performance level. I could wrestle a bunch more decimal places out of the numbers if I felt like covering up the fuzziness of the temperature measurement system, but there's no real accuracy beyond two decimal places. What this means is that the three Power Devices products might actually have somewhat different performance form each other - in fact, I'd be surprised if they didn't. But they score similarly enough that performance isn't grounds for picking one or another of them, and they also score slightly better than normal thermal grease. Another caveat: These results aren't the actual thermal resistance of the thermal compound. That's considerably lower. The test rig tells me how much hotter than ambient the thermal probe inside my heater gets; since I know the voltage across the heater and its resistance, I can therefore come up with a degrees Celsius per watt performance figure expressing the approximate effectiveness of the whole cooling system, from the point of view of the probe inside the heater resistor. If the contribution of the thermal interface to the final figure was very small, these results wouldn't be good for anything. But as I found out in my previous thermal goop test, it certainly is possible to get considerably better and worse figures out of this system by changing nothing but the thermal interface material. So the effect of the thermal goop isn't swamped by other variables. People who use a lot of thermal grease also tend to use a lot of tissues, paper towels and valuable tax documents that they grabbed by accident. Ease of cleanup is a significant factor if thermal compound is a big part of your life. If you don't have the right solvents to hand, cleaning up thermal grease isn't a pretty process. I use naphtha lighter fluid; it's unlikely to hurt anything on a motherboard, but it dissolves the carrier material in pretty much every kind of thermal compound. It works on the Power Devices compounds, too, including the residue that's left when you dismantle a Powerstrate pad assembly. The Power Devices goop itself is about as annoying to clean up as the other gum-type compounds I've seen, pound for pound - but because the Power Devices compound has more efficient application methods, there's considerably less excess goop sitting around, and the actual job is thus rather easier. Because there's not very much of it there, you can clean this stuff up with just dry paper towels and some elbow grease. It's easier if you dampen your cleaning paper with some naphtha, though, and that's definitely a good idea for getting compound off a CPU. Note, by the way, that drowning current AMD CPUs in naphtha is not a good idea. Not because it'll hurt the chip package or the motherboard, but because it'll cause the little rubber spacer dots on the top of the processor to swell up and drop off. You have been warned. You can buy Power Devices products direct from the manufacturers, but they've got a $US100 minimum order. The AJ-S-17H-15B and AF-S-145-12B Powerstrate pads I checked out come in rolls of at least 500, at 20 US cents each, neatly hitting that minimum order price. They get cheaper as you buy more, and 10,000 pads will cost you a mere $US1400. 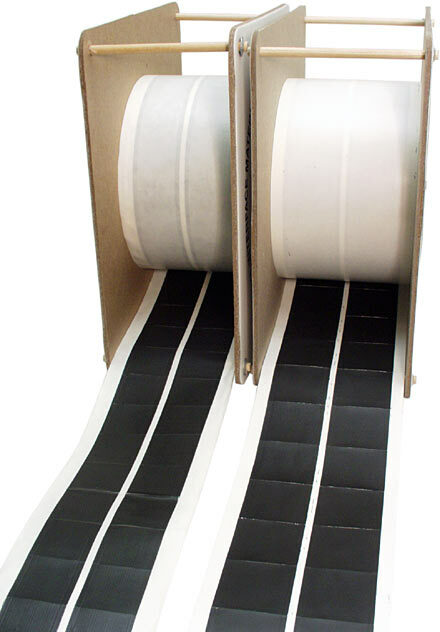 The TC-175-125 and PF-175-125 applicators (for Thermstrate and Powerfilm, respectively) are $US9.50 each from the manufacturer; you'll need to buy 11 to hit the minimum order price. You can, as always, pay a lot more if you shop poorly. When I was hunting for online retailers selling these products (and not finding any), I managed to find the Loctite-branded version of Thermstrate TC at RS Components, for a rather thrilling £UK18.42 per stick. About $US26.50, as I write this. There's a reason why "RS" is frequently said to stand for "Ripoff Spares". If someone starts reselling Powerstrate pads in packs of ten or so, they'll be a decent product for normal PC tweakers. Rolls of zillions of them are only useful for businesses, or as a group purchase for a whole user group. The bar applicator compounds, however, are quite sensible purchases for anyone who assembles a fair number of PCs, including the more... enthusiastic... kind of home user. Again, you're not likely to need 16 of them, but PC tweaking product resellers will be able to get them in easily enough in response to the clamour of their customers. At the moment, if you want to buy one or two units, check your local engineering suppliers; Power Devices products are just part of the Loctite catalogue, so they ought not to be too hard to find. While you're reseller-hunting, bear in mind that Thermstrate TC is also sold as "Ultrastick" by Aavid Thermalloy. One bar of Thermstrate TC can be quite realistically expected to last you about as long as one of those preposterously big toothpaste-tubes of regular thermal grease, but it shouldn't retail for a lot more than a little three gram tube of fancy grease. You can't complain about that. If you only change a CPU cooler once a year, never mind this stuff. The little baggies of grease that come with many coolers ought to meet your needs. I, though, will definitely be getting some use out of the Thermstrate and Powerfilm applicators - and the Powerstrate squares too, since I've got 'em. This is the thermal compound to use when you're tired of mucking about.